The occupation of the Town Creek site by Native Americans goes back 10,000 years. Around 1200 CE the development of the earth mound began, huts were constructed, and a stockade was erected around the site for protection. During this time, burials and special ceremonies were performed at Town Creek. The earth mound itself was used as a burial site and a meeting place for ceremonies. Bodies were buried in different positions inside the mound – some were laid out on their backs, while others were curled on their side into a fetal position, the bodies of infants and children were often placed inside large earthen vessels and buried. The approximately 10 foot tall mound is preserved at Town Creek although the bodies are no longer visible – a friend tells me that there were once windows in the mound that allowed visitors to see the buried skeletons. 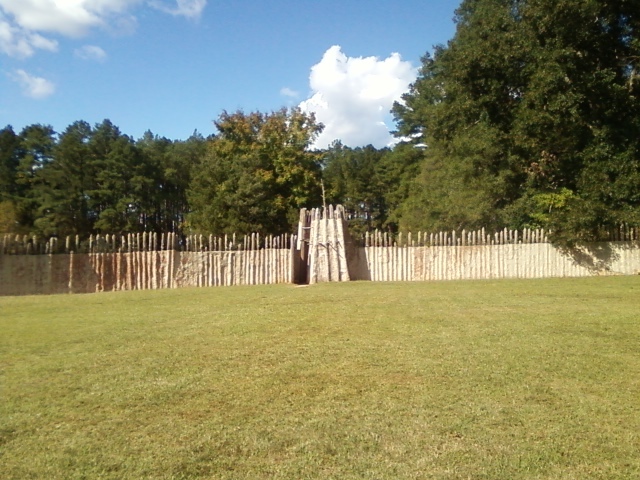 Four buildings have been re-created on the site to appear as they would have when the Pee Dee Indians lived there. The Guard Tower is the first of these buildings that you encounter. It’s a cone-shaped enclosure along the wall of the stockade. My preschooler thought it resembled a cave and excitedly declared that she could sleep there. The next hut is the Mortuary where you can step inside and view mannequins behind glass reenacting the burial of a child. A button on the panel in front of you starts the recorded narration. The East Lodge provides a demonstration of the building technique used to create all of the structures at Town Creek. And finally, the Town House sits atop the earth mound and is furnished with log benches and a small altar-like table which sits at the front of the hut and faces the benches. Visitors can find bathrooms, with a baby changing station in the men’s room, at the Visitor’s Center. 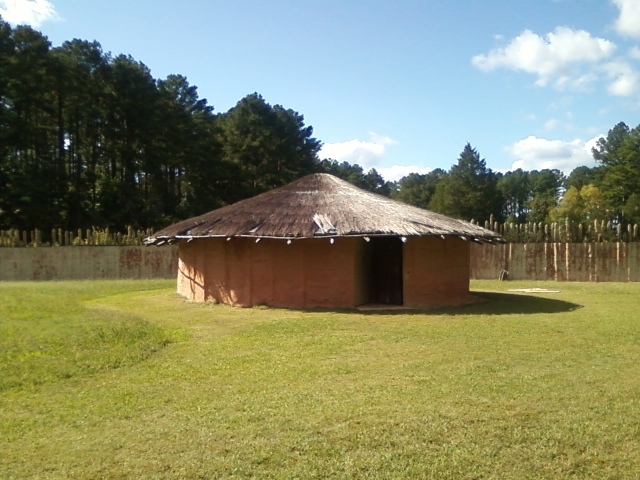 Two small exhibits are also housed in the Center – one detailing the archaeologically significant Hardaway site and another which illustrates aspects of the Pee Dee culture at Town Creek. 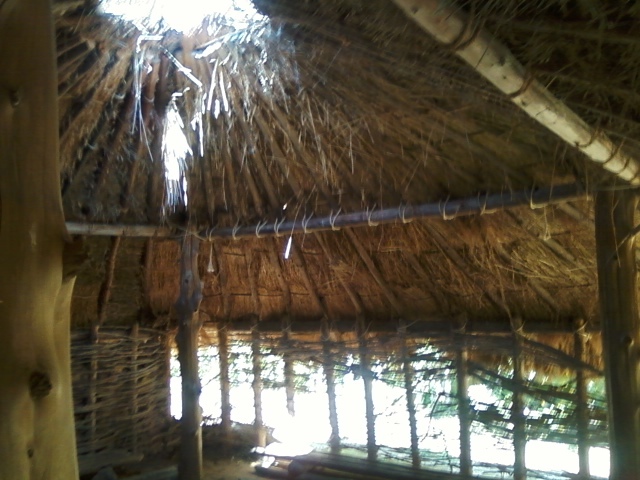 The Hardaway exhibit has some interactive elements to help kids understand how Native Americans made tools. The Pee Dee exhibit features a ceramic urn used in burials at Town Creek as well as two heads of Pee Dee Indians reconstructed from skeletal evidence found at the site. The Visitor’s Center also contains a small gift shop with the expected Native American swag as well as a comprehensive offering of books on Indian culture in North Carolina. I have to admit that when I planned to visit Town Creek I doubted that my kids would have much fun; I was going mostly because I was really interested in seeing an Indian mound. But surprisingly, my kids had a great time. There was plenty of open grassland for the kids to run through and roughhouse in inside the stockade area. My kids loved the Mortuary hut because it’s dark and a little spooky with the mannequins frozen in mid-ceremony, plus they got to push a button that started a pre-recorded message. My toddler really enjoyed running in and out of all of the huts. And we had a race to see who could get up the mound first – there’s a ramp ascending the mound that requires a bit of caution when walking up because it is steep and relatively smooth. If you make the trip you will need to plan accordingly because most of the drive is on rural roads and there aren’t a whole lot of nearby places to stop for food or potty breaks. There are several picnic tables at Town Creek, if you’re inclined to bring a lunch. You’ll definitely want to GPS or Mapquest Town Creek because there is very little directive signage along the way. 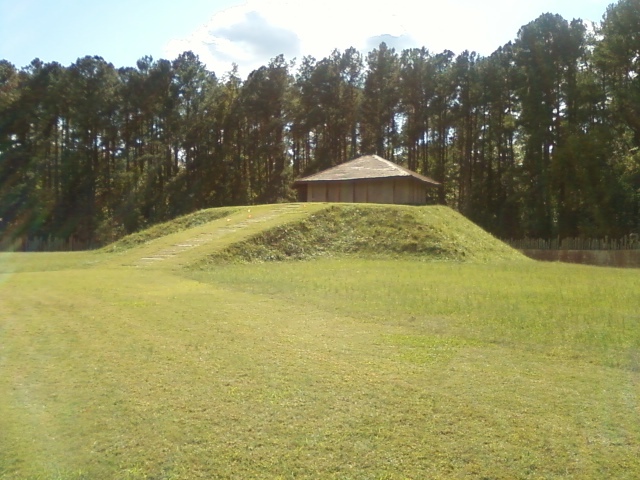 More people should definitely make the drive to see Town Creek, one of only two surviving Indian mounds in NC and the only one with an interpretive center. Written by: Sean on February 19, 2012.